PRETTY LOOKING BACK: AN ORCHESTRAL INTERPRETATION CELEBRATING THE 25TH ANNIVERSARY OF HOLE'S FIRST ALBUM, "PRETTY ON THE INSIDE"
Mendelssohn, Tchaikovsky, Gremlins Rag, Piazzolla, and more. KSQ performs Daniel Pearl World Music Days Concert at 7pm, GCC Planetarium. Reservations only - seating is limited! Tickets available through: Brown Paper Tickets at GCC Concert Series. KSQ performs Daniel Pearl World Music Days Concert at 2 pm, La Galera Gitana. Reception Following. Mendelssohn, Tchaikovsky, Gremlins Rag, Piazzolla, and more. 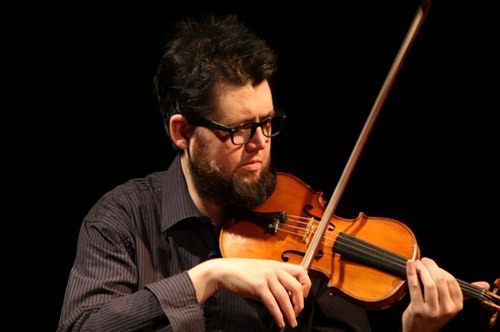 Accomplished Canadian violinist, composer and artist Eric KM Clark is a specialist in new and experimental music. Based in Los Angeles, Eric is a member of the Kadima String Quartet, Gurrisonic and co-founder/co-director of Southland Ensemble. He was also a member of the genre-setting ensemble The California E.A.R. Unit for 6 years, which gave important performances and masterclasses on contemporary music and technique around the world. Eric has worked with many of the world's most innovative artists and ensembles, including the late James Tenney, Jurg Frey, Michael Gordon, Richard Foreman, Guy Maddin, Christian Kesten, Michael Pisaro, Morton Subotnick and Han Bennink. His playing has been released on the labels Innova, New World, Tonehole Music, Sundialtech and Tzadik, while his compositions have been released on Henceforth Records and CQB. His visual art has been exhibited at the Torrance Art Museum and the wulf., while his sound installations have been presented at MOCA (during their Sunday Studio) in Los Angeles and the Inglewood Library. Eric has attended residencies at the Atlantic Center for the Arts and the Banff Arts Centre; and received his MFA in performance and composition from the California Institute of the Arts in 2006. A regular contributor to the new music scenes around North America and Europe, Eric’s compositions have been performed at venues and festivals such as REDCAT, Western Front in Vancouver, Open Space in Victoria, the Berkshire Fringe Festival, the Bang On A Can Marathon, the Extensible Electric Guitar Festival, and the Ontological-Hysteric Incubator. He has written several works that explore Hearing Deprivation, which involves combining earplugs and over-the-head headphones playing back extremely loud white noise to mask a performer’s hearing. His composition exPAT: Deprivation Music No. 4 has received particular critical acclaim, being hailed as “an exhilarating and occasionally confounding exercise in divergence, confluence, and middle-finger merriment” (Signal to Noise, 59 / FALL 2010) and it “might be the most disquieting piece of music you'll ever hear” (kleineKultur,06/08/2010). Eric co-founded and co-directed the wulf. from 2008-2013, an experimental performance venue located in downtown Los Angeles that provides free experimental concerts and other artistic events open to the general public.